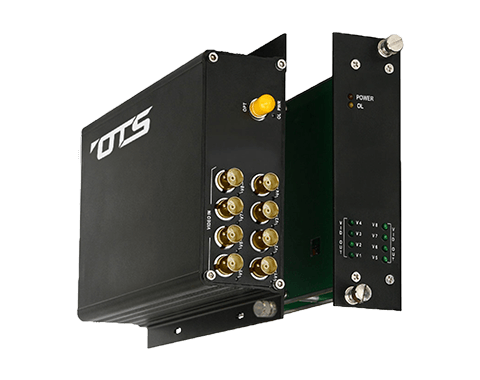 The 10-Bit Digital Video transmission transmitters, receivers and multiplexer products feature highperformance laser-based optics for the clearest, most reliable data transmission in both single and multi-mode with no video degradation over the entire operating distance (up to 20km). This plug-and-play product family provides instant compatibility for most major security manufacturers' equipment and reliability in harsh environments, a perfect compliment to any commercial, government or intelligent transportation application. The product features in card module or standalone type. Options - ST type connector is standard. For FC type, specify “F” in the suffix. E.g. FMT. - Please feel free to consult factory if longer transmission distance is required. Power Adaptor - Power adaptor included for standalone type only. Rack Mount Chassis - FT-C18 is to be purchased separately. Please refer to accessories section for the details.